Aplus Finetek is pleased to announce the availability of its newest EG series magnetostrictive level transmitter, the EG31, that is used to precisely measure coolant level in an evaporator within an industrial air or water cooled chiller system. Accurate reservoir level control is important in a chiller system for precise control of refrigerant flow through the chiller system expansion valve. 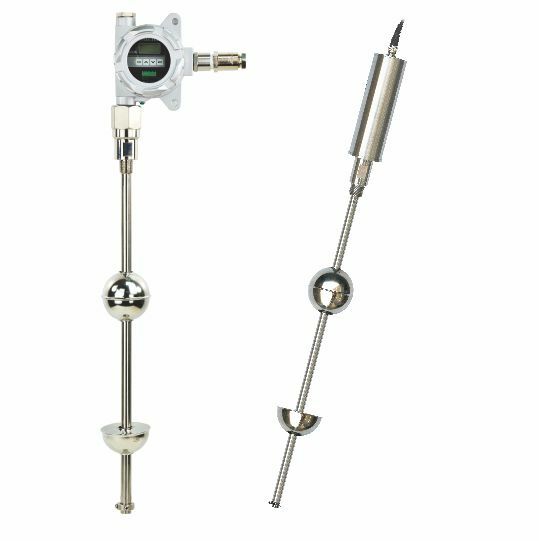 The EG31 magnetostrictive level transmitter also includes a customized installation mechanism that allows the level transmitter to be installed or removed without taking the chiller system out of service. The EG31 level transmitter is currently used by a global leader in the manufacture of large scale industrial chiller system type items. The EG31 continuous level transmitter uses the principles of buoyancy and magnetostriction to accurately measure the changing level of coolant within the evaporator of a chiller system. A float, appropriately sized for the specific fluid density, is mounted on the level transmitter stem such that the float will travel up and down due to the buoyancy of the float with the fluid being measured. The float contains a magnetic element. To locate the float position the EG31 level transmitter electronics sends a short current pulse down a sensor wire located within the transmitter stem with a specific frequency, setting up a magnetic field along its entire length. The overall effect is that during the brief time that the current flows, a torsional force is produced in the wire, much like a sonic vibration or wave, and travels back to the EG31 electronics. A timing circuit exists within the electronics which measures the time-of-flight (TOF) between the start of the current pulse and the return signal. In this manner the float’s location (and therefore the fluid level) is very precisely determined and presented as a level signal by the transmitter, typically 4-20mA. For more information look at our EG Series product page and contact Aplus Finetek Sensor, Inc. at 815-632-3132 or email us at info@aplusfine.com.